Choosing your venue is one of the most important decisions you’ll make when planning your wedding. Besides your dress, wedding music and caterer, of course! Every woman wants to feel like a princess on her big day, so a castle wedding is the perfect venue for a fairytale wedding. Peckforton Castle is one of Cheshire’s finest wedding venues and can make the best day of your life just that little bit extra special. With stunning grounds, breathtaking views of Cheshire’s countryside and romantic interiors, it’s no wonder Peckforton Castle has been hailed as one of Cheshire’s most prestigious wedding venues. The castle is located in the rolling hills of Peckforton, in the heart of Cheshire’s idyllic countryside. The castle itself is nestled within enchanting woodland. As you drive through the woodland along the meandering driveway, you begin to realise what a special place this is. As you reach the edge of the forest, you’re greeted with the breathtaking view of the fairytale castle, which will be the first of many awe-inspiring experiences on your fairytale wedding day. What does the castle have to offer? It’s not just about the exterior with Peckforton Castle, although the view of the castle itself is enough to take your breath away. Once you step inside the castle you’ll start to uncover each magical touch which will make your big day just that little bit more special. They have a choice of four rooms which can cater for up to 275 guests. Their cosy wine cellar is located in the heart of the castle. The intimate wine cellar is lit entirely by candles, making it an incredibly magical, romantic setting for your guests to enjoy a glass of champagne or two. The great hall is one truly stunning setting for your wedding. With stained glass windows, an original Minton Hollins tiled floor and an original working fire place – this is one impressive place to say ‘I do’. Their Hexagonal room is perfect for a more intimate Cheshire wedding, able to seat up to 100 guests for a ceremony, it boasts a truly personal atmosphere. With its log burning fires and interesting architecture, it’s hard not to fall in love with this setting. For the larger wedding, Peckforton Castle has a large Drawing Room on offer. As you enter the room, you’ll notice the large medieval tapestries hung on the wall, beautiful chandeliers illuminating the room and the large oriel windows draped with striking red velvet curtains, making for a beautiful setting for your big day. Their award-winning food and drink will be just one of the things making you want to relive your wedding day again and again. Their top-quality wedding breakfast menus will have you spoiled for choice and will certainly make sure that you make time to eat on your big day! From their locally-sourced meat, fish and vegetables, you’re guaranteed to have a mouth-watering meal to remember. 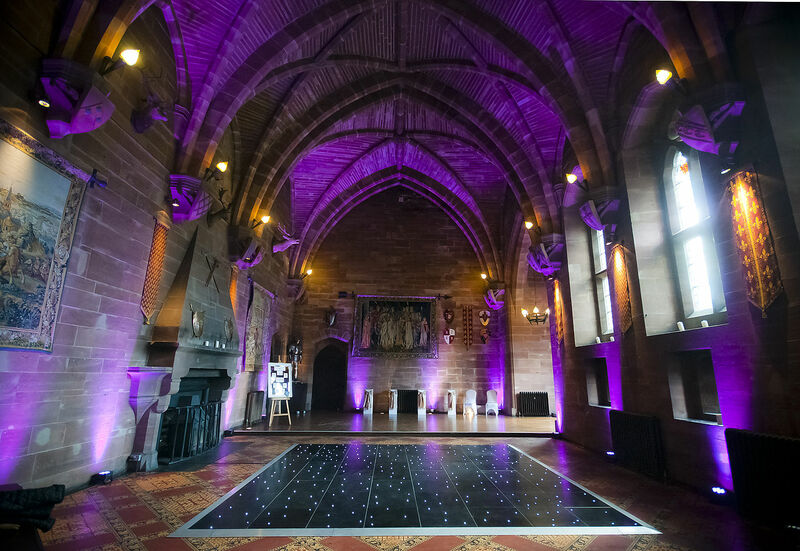 Peckforton Castle has a range of unique elements available for that extra wow-factor on your wedding day. From having your wedding rings flown down the aisle by a trained owl to off-road 4×4 driving experiences for your guests, you’ll certainly host a day to remember at Peckforton Castle. Finally, when your big day is over and you’ve said goodbye to all of your guests, you can venture up to the stunning bridal suite. The lavishly-furnished suite is the perfect place to end your big day and is every-bit as stunning as the rest of the castle. The four poster bed, original features and stunning views; this is the perfect setting to spend your first night as a married couple. The day after your wedding you can treat yourselves to a relaxing morning in the castle’s tranquil spa. Featuring two hot tubs, a sauna and an array of luxurious treatments, this is certainly one of the hotel’s features which shouldn’t be missed. Peckforton Castle is one truly magical wedding venue that’ll deliver the most magical, fairytale wedding of your dreams. The only problem is choosing which areas of the castle to have your photos taken first!